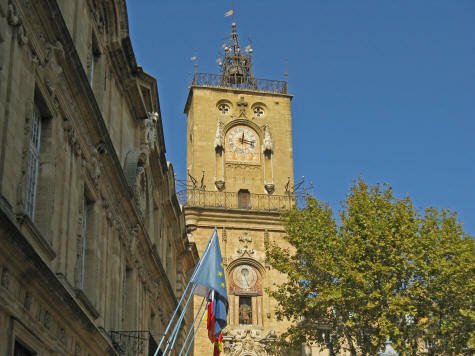 The bell tower (Belfry) is situated in Place de l'Hotel de Ville next to the City Hall. Built in 1510, an astronomic clock was added to the tower in 1661. The Belfry is adorned with wooden status, carvings and crests. Many restaurants and cafes are situated on this central square in Aix-en-Provence. It is a wonderful place for tourists to enjoy a drink and savor the beauty of the Belfry and adjacent city hall.